The Portable Workstation contest was just the motivation I needed to do some Woodworking and get things a bit organized in my garage. I'm getting to the point where I have to move a tool or 3 to get to or use the tool I need to use. Time to fix that. Here were my needs I needed satisfied. It needed to use a cabinet base much like a kitchen cabinet lower. It needed a drawer capable of holding a couple hundred pounds without tipping the whole cabinet over. It needed a large bench top to use all of my tools on. It needs to have an open design to grab tools from each side easily. First I checked through all of my scrap plywood and other wood to see what I had to work with. After spending a couple hours sketching out my design on graph paper I came up with a plan for how to make my bench a reality. I only have about $40 in it total (drawer slides and wheels), but I'd be looking at about $100-$150 if I had to buy all of my material. I have included notes on several of the pictures, so please take the time to look them all over. I'm sorry for the lettering being small on some of them, it was the best I could do. When making a cabinet, normally the first step is to cut a whole sheet of plywood lengthwise at the width you need. In my case I made it 22". You will have a left over strip in the middle of your whole sheet to use for screw strips to assemble your case. Extra sets of hands or some kind of outfeed table tend to be very helpful. I have pictures of what this step would look like from a whole sheet. My pieces were already precut leftovers from another project. I made the sides much longer than standard since I wanted my finished height to be about 40". The width of the cabinet was dictated by what I had for material on hand, which ended up to be 38". The screw strips need to be this same length (38"). At least 2 of them need to be as wide as your toe kick is tall. Mark out and cut a toe kick into your side boards. You can use a hand saw, band saw, scroll saw, saber saw...well you get the idea. My toe kicks measured 3x3. Time so far - 30 minutes or less. 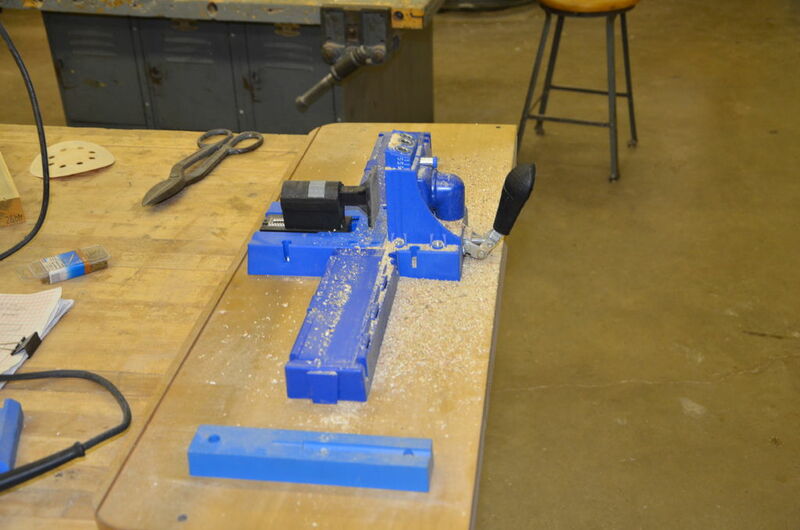 I use the Kreg Tool Pocket hole Jig A LOT in my shop. It makes it easy to assemble projects, and to hide all of the assembly holes. In a normal situation the pocket holes would be to the outside of the cabinet since it would be hidden by another cabinet, or covered by a thin piece of plywood later. I didn't really care if I saw the pocket holes or not, so I put them on the inside and forgot about it. Each of your screw strips will get several pocket holes. Two on each end (for screwing to the cabinet sides, and 3-5 across a long face for attaching trim later. 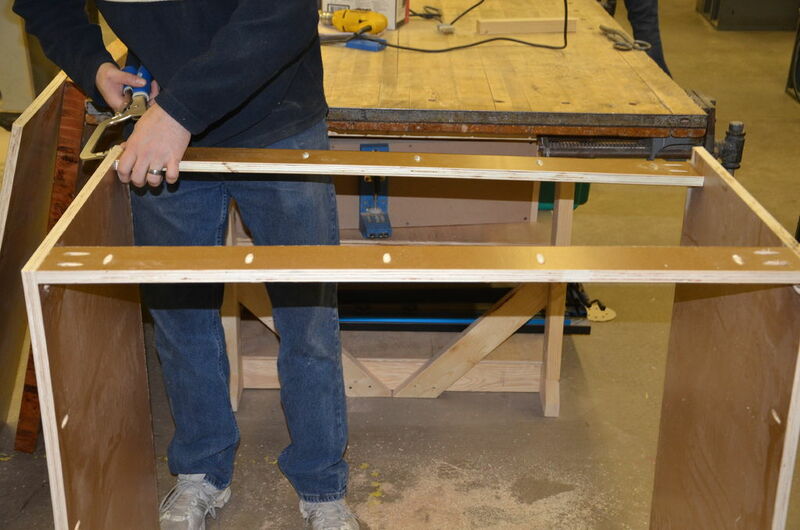 The base will get 5 screws down each side for attaching to the side. Because my plywood is prefinished, it comes with pros and cons. The main con is the wood is slippery, which makes clamping and screwing the cabinet together difficult. It can also be a little more pricey. Pros include I don't have to spray a finish on it so I save lots of time. To help with the slippery problem I sand the wood where it will go together. If this were a kitchen cabinet I would measure things out and tape an area off. With this project I marked off the area and just sanded it. Next I screw the base to the cabinet sides. I do NOT attach the screw strips to the base yet. Then I get the other side and clamp it to the screw strips and screw that side on, along with the base to that side. Now I can screw the screw strips to the base taking care to line things up nice. Now the cabinet will stand on its own. For the top screw strips, normally the front one would be flat to the top, and the back would be flat to the wall. Both of mine are flat to the top to attach my bench top. The hardest part of the face frames is the forethought needed. All of my frame pieces were 1.5 inches wide. I wanted the frames to stand 1/4 inch proud on the outside. My math looked something like : 38" total width + (2x 1/4" overhang) = 38.5" - (1.5"x2 frame width) = 35.5" horizontal frame pieces. 35" cabinet face (from the top, to the top of the base) + 1.5" thickness of face frame = 36.5" vertical frame pieces. I built the rear frame slightly different, but same forethought applies. ***TIP*** If you need several pieces to be the same length, it is best to find a board that is wide enough to get all of those pieces from, cut it to length, and rip all of the pieces out of it. I used mostly scrap lumber, so I needed to do it differently. Everybody should know that its a huge no no to use the table saw fence and miter gauge at the same time because of risk of kickback ( I hope you don't get to experience one). Generally its good practice to never use a fence on something that is longer than it is wide (when cutting for length) for the same reason. The work around is to clamp a scrap piece of wood to the fence to measure to. 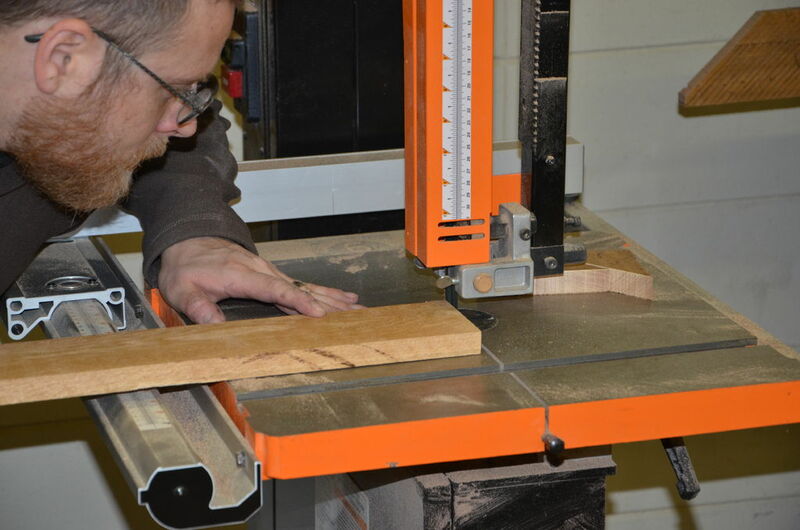 You will use your miter gauge and slide the wood up to the piece of wood, and then cut. When you move forward you will clear the scrap wood, and leave a safe gap between your wood and the fence. Once all of your pieces are cut to length, dry fit them and make sure you did your math right. Also plan where you will place your pocket screw holes. Generally they will be placed in the horizontal pieces. I was not able to follow this mantra on the rear facing, but it all hides well. Glue, place, and clamp the wood in place and screw it tight. 8 screws and you have a finished face frame. The better you do your clamping and screwing, the less you will have to sand things. This is the time you will need to even out any small imperfections in your frame. Make sure you sand all surfaces to eliminate saw marks/burns, planer chatter (knife marks), and piece to piece unevenness. This is the step everyone will notice. You can hide A LOT of ills with a good sand job. Wipe off all of the saw dust, or better yet, blow it off with compressed air. You can stain and clear coat, or just clear coat as I did. If I were doing a lot of stuff I would use a HVLP unit I bought at harbor freight to spray on the finish. This was such a small amount, and I had a couple half used cans of clear spray, so I used that. Make sure you get an even coat, and follow manufacturer directions. If I were concerned with making the finish as smooth as the cabinet sides, I would have started with a sanding sealer, sanded smooth, and then clear coated. I felt this was overkill for a project that would be scratched before it made it to the garage. If there is enough interest in how to finish a woods project with store bought products, I can certainly do that later. time so far - 2 hours 15 mins. To assemble, I laid my cabinet on its side, on top of a 1/4" piece of plywood. This gave me the correct amount of reveal without fighting things. Starting at one end I worked my way down one side. I flipped the cabinet and repeated, and then attached across the top. There is no great way to attach the bottom, but if there is a gap that needs attention, you can finish nail and hide that hole. I attach the toe kick board by screwing from the back side. I had to relieve one spot to make it fit nice, which I did on the bandsaw. The cabinet is coming along nicely. I wanted my project to be able to roll around easily without the need to lock wheels to keep it in place. My solution was to place two casters at one end and two feet on the other end and move it a bit like a wheelbarrow. Each wheel was rated to 220 pounds, so I figure 440 pounds should be enough to handle roughly half of the weight. The wheels I bought were about 1/2" taller than the area they were to go in to, so the cabinet will hover slightly. To attach the wheels I held them in place and marked the location of the holes with the drill bit. Once all 4 holes were marked I drilled all the way through. Then I slid washered bolts through the cabinet, slid on the wheel, locking washers, and nutted the whole unit together. Originally I was going to hide the wheel in front, but decided I wanted it was far outboard as I could for stability. I found some nail on "sliding feet" to put on the other side of the cabinet. They are a brass and plastic make up and were the correct height to make my cabinet level again. With weight on the feet the cabinet will stay put. Take some weight off and it will slide. The first thing I did was put spacer blocks where I wanted to attach the slides. The drawer slides need to be at least close to even with the inside of the face frames. Mine are a little thick, but it was a better problem than to thin. I glued and finish nailed mine on. The drawer slides I bought were rated to 100 lbs per pair. I wanted to be able to double that...just in case. I decided to use 2 slides per side. Follow the directions for the slides exactly so they will fit correctly. My slides called for the drawer to have 1/2" clearance on each side of the opening. The math can be a little confusing but take your time and you'll be fine. I started by making the left and right sides of the drawer first. I cut the rabbit at each end for the front and back pieces to attach to. Once these are cut to size with rabbits, figuring the length of your front and back will be easier. I cut a 3/4" groove on the inside of all 4 pieces for installing the drawer bottom. I glued and nailed both sides to the front, and then took measurements for the drawer bottom. the drawer bottom was made slightly loose and was not nailed or glued to allow for wood to grow and shrink without destroying my drawer. I used a spacer block to hold my drawer slide in place at the bottom of the cabinet. This was just a cheat to make both sides the same quickly. 3 screws were used to attach each slide piece. To attach the slide piece to the drawer I set it on a flat surface and screwed it to the drawer. I didn't need the drawer to be perfectly centered in a hole like in a kitchen, so I didn't over think it. To install the second set of slides, I simply stacked it on top of the other set in the cabinet. With the drawer in the open position I was able to hit 5 of 6 screws. I had to release a slide to get the 6th. The bench top is something I bought from a neighbor for $40 a few years back. The top was in good shape, but the base was only a base with no storage etc. It measures 38" deep, 54" wide, and 2" thick, and is made up of glued up strips of white oak. The thing is heavy but strong enough to take more abuse than I will probably ever throw at it. I know I couldn't have built a top like this for $40 out of like materials. I decided to put the heavy offset on my bench for 2 reasons. 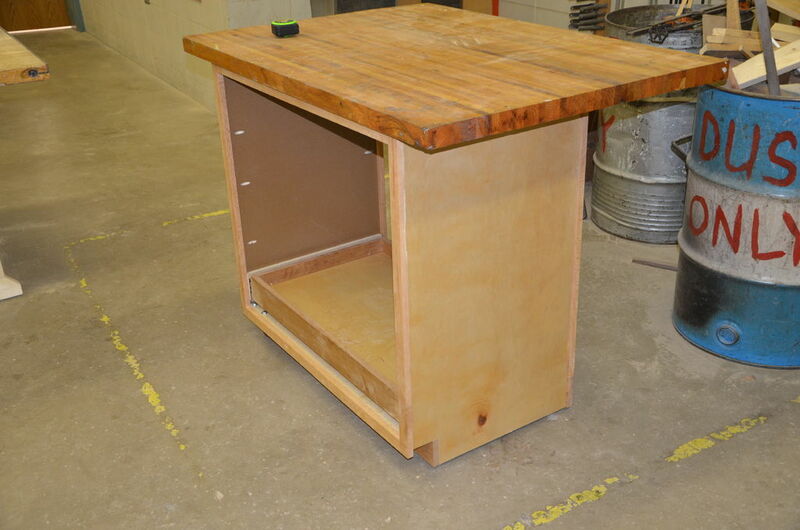 1- The large overhang side is where I will have my lathe, and I wanted to park my stool there to sit for long periods. 2- I needed a counter balance. After carefully centering and placing the bench top, I screwed up through my screw strips in several places. Because this top is heavy, and I would like to be able to transport it easier....I added two "centering blocks" so that I can quickly find center for quick assembly. Keen eyes may notice there are a few bar clamps on the back side of the table as I'm standing in the drawer. These only weight about 20 pounds but were enough to keep the cabinet stable with my 200lbs in it. My lathe weighs considerably more. Id call the project a success so far. Now to get it home and load it up. Guess that means I have to reorganize my mess. I shuffled things around in my garage a bit and got things close to where I can work nice again. As you can see I have my huge miter saw and a planer set into the drawer of the cabinet, and the lathe on top. I am able to move the cabinet ok. I realized after I put the lathe on that I put the wheels on the wrong end. I have to lift up on the heaviest end of the cabinet because of the weight of the motor etc. I can do it, but I will be making a set of handles to grab on to. I am able to open the drawer, load it, unload it etc without the cabinet feeling unbalanced. Did I satisfy my design criteria? -It would be nice if it were tall enough for me to stand comfortably at since I'm 6'1 - Its tall enough for sure. Oddly tall enough. Ive never experienced anything that. In fact it will take me a while to get used to it. I think it will work awesome, especially with my stool on the lathe. -It needed to be easily mobile without the need to lock wheels to stay put. - Easily mobile? Needs work. But its not moving unless I pick up on the end. Ill be modifying a bit to call this step a success. -It needed a drawer capable of holding a couple hundred pounds without tipping the whole cabinet over. = It held me, and it does well loaded with tools too. -It needed a large bench top to use all of my tools on. - the lathe is permanent, but the saw and planer are occasional use only. The large area of the bench can be used for many things. It will make for a nice bench to work from. -It needs to have an open design to grab tools from each side easily. Its open from each side for sure, but with the large overhang I will be only getting tools from one side. I cant wait to start using the bench, and specifically the lathe, for my next contest entry. Long story short....perfect. No. Pretty darn good with room for easy improvement? You betcha. I hope you were all able to get some good information out of this Instructable. As always, your comments are valued, Ill try to answer any questions etc you might have. Thanks for your support. Wow, well thought out, well explained, great pics with explanation, and it is adjustable to people of other heights. What else could we ask for besides you coming to build it for us? OH wait.. will you deliver the materials? lol This is great and I will be looking to try and build one of these as soon as weather allows me to! You got my vote! Thanks. Theres always room for improvement. Thats part of the fun in new projects. Good luck with yours! My favourite part in the process - when the storage unit starts looking like it's coming together and completion is on the horizon! Like I said with step #8, I had a bit of problems with it but I finally got to the end with a relatively decnt storage unit! Woohoo! post a picture.. I finally feel like an accomplished poster. haha. there's defiantly things I would change about the rolling around if the unit... but dang it.. it's useful. glad you figured it out. Okay, I had issues with this particular step. Couldn't get the drawer to fit in tightly enough or sit just the way I wanted it to in the overall look of the cupboard… I may have screwed up a little with my measurements, but that's a lesson learnt for next time! I am definitely going to be making something like this. Maybe some fold down feet with rubber pads. Gas lifters to raise hinged sides up for table extentions...hmm yeah I'm going to have fun with this. Thank you for the inspiration! Fold down feet could work well if you plan out wheel sizes and use a piano hinge for feet. Would make it easy to "lock" in place. I may end up giving that a whirl if my dolly idea fails. Thanks! Can you give more details about the top? What are the overall dimensions? Did you fabricate it yourself? Or was it a 'left over' from another project? The top was something I bought from the neighbor that he made years ago. The base was useless. The top is 38 deep, 54 wide, and 2 thick. Its made of glued up oak strips. Bought the whole bench for 40 bucks...would have cost me more to make one like it. I should include a bit more one that. Thanks! "If it's worth doing it's worth overdoing." ?? One of my favorite lines. Easier to overdo it once than redo it later. Well done! I am inspired to build a mobile power tool workstation too. I especially liked your doubling up of the drawer slides. Keep it up! and thanks for sharing! Thanks. All I'm planning on doing for improvements is making a dolly of sorts to slide under the non wheeled side to aids in moving things around. I still like the idea of no wheels to have to lock before use. Good luck on yours. You should enter this into the woodworking and storage contests. 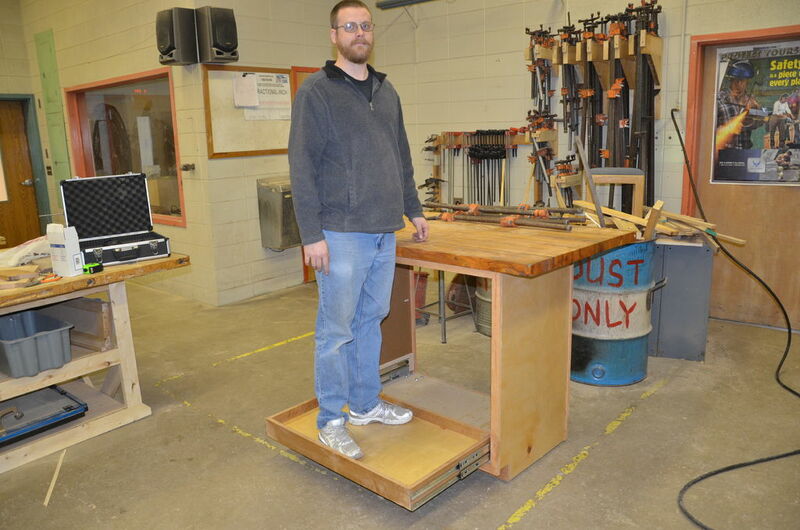 I'm waiting for approval in both the woodworking and portable work station contests. Thanks for your confidence. Very nice. The never ending battle to organize and make/find space is helped by your project! Good job! Thanks. It all started when I had a project to do on my new to me lathe and had no where to put it. Looking forward to making wood chips.